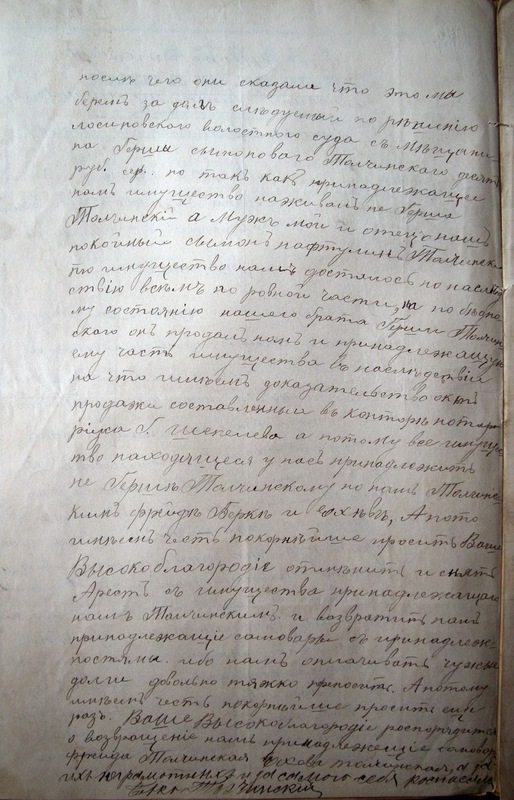 I've posted about the first pages in an 1899 court document regarding my Tolchinsky family here, here, here, here and here. Gersh Tolchinsky (half brother of my great-great grandfather Hillel) had debts, and his family's samovars were taken to pay those debts--however the family entered an 1897 document into evidence to show that Gersh did not own the samovars and in fact had signed them and other property over to his mother and two of his siblings in 1897 for 48 rubles. Here's the final summary & outcome of the case. 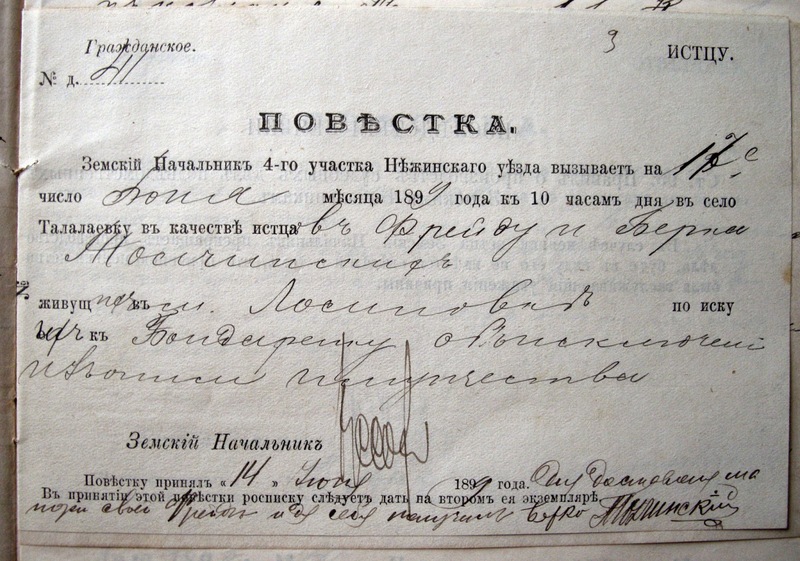 I've posted about the first pages in an 1899 court document regarding my Tolchinsky family here, here, here and here . Gersh Tolchinsky (half brother of my great-great grandfather Hillel) had debts, and his family's samovars were taken to pay those debts--however the family entered an 1897 document into evidence to show that Gersh did not own the samovars and in fact had signed them and other property over to his mother and two of his siblings in 1897 for 48 rubles. Parties were summoned to court. 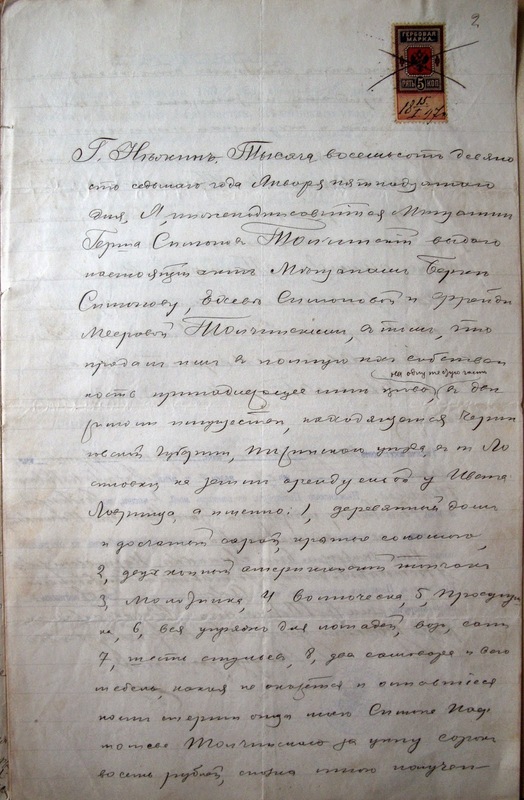 I've posted about the first pages in an 1899 court document regarding my Tolchinsky family here, here and here. Gersh Tolchinsky (half brother of my great-great grandfather Hillel) had debts, and his family's samovars were taken to pay those debts--however the family entered an 1897 document into evidence to show that Gersh did not own the samovars and in fact had signed them and other property over to his mother and two of his siblings in 1897 for 48 rubles. This is the second half of that 1897 document. 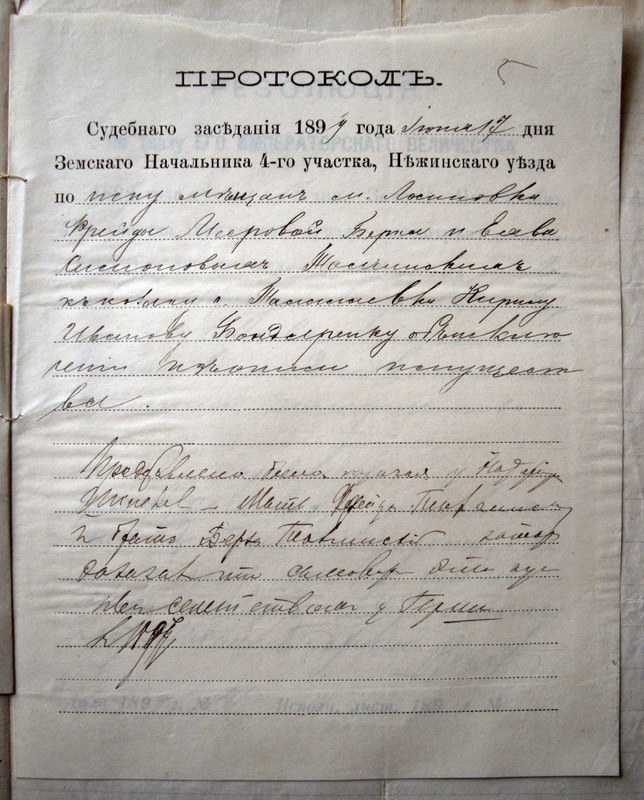 I've posted about the first pages in an 1899 court document regarding my Tolchinsky family here and here. 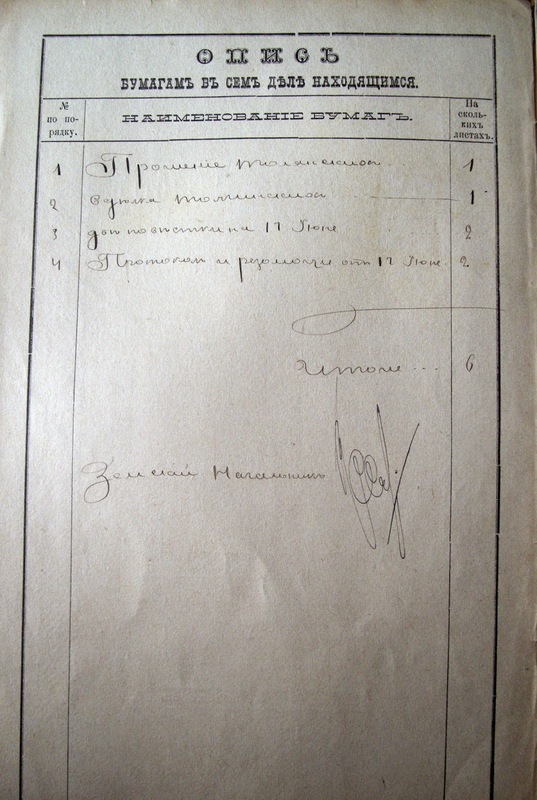 Gersh Tolchinsky (half brother of my great-great grandfather Hillel) had debts, and his family's samovars were taken to pay those debts--however this document was entered into evidence to show that Gersh did not own the samovars. 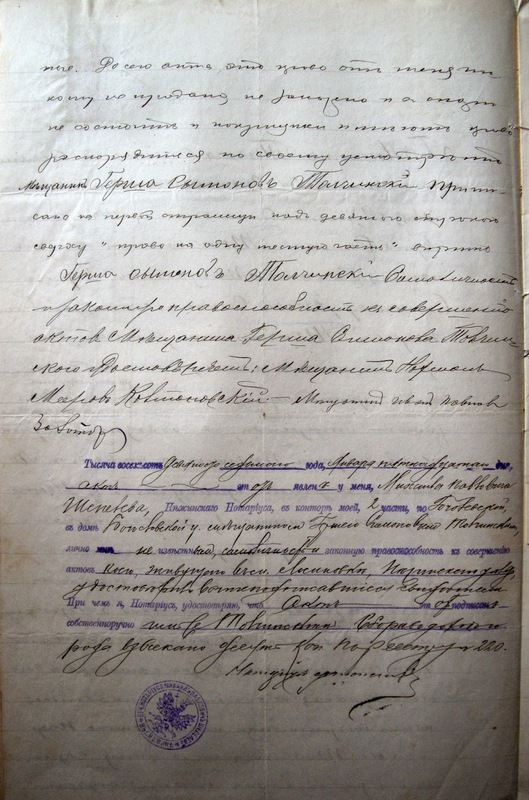 The Tolchinsky family was involved in a court case in Nezhin, Russian Empire (now Ukraine) in 1899. The case is slowly being translated and I can't wait to find out how it ends. So far there are Cossacks and theft involved!